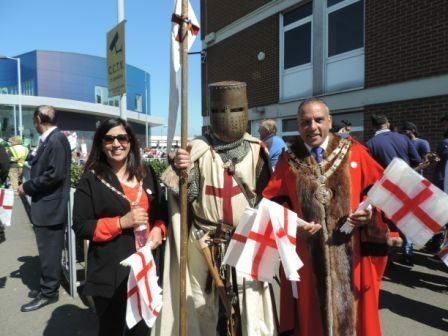 St Georges Day 2015 was celebrated throughout Dartford on the 23rd April 2015. 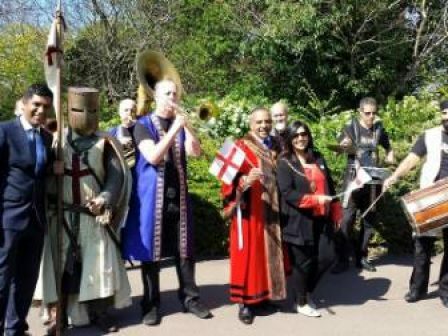 Community Cohesion Events organised a parade through Dartford Town Centre which was led by the Mayor of Dartford, Avtar Mayor of Dartford Leads St George's Day Parade Sandhu MBE and the Mayoress Sukh Sandhu. The parade was attended by over 500 people of which included 12 different local Dartford schools who had all made a range of props including dragons and shields. The day was well supported by a range of community groups such as the West Hill Morris Dancers, 4x4 Bhangra Dancers and a brass band who all took part during the parade procession from the council offices to the band stand in Dartford Central Park. The Mayor and Mayoress handed out flags and badges throughout with the Mayor saying a few words on the bandstand. Avtar Sandhu MBE thanked Community Cohesion Events for organising the successful parade as well as those who had supported it including the council, the local community and the Dartford schools along with their parents in attendance. 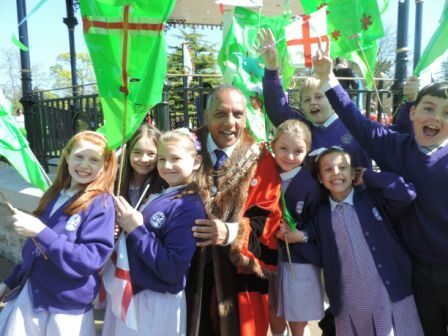 To find out more about the Mayor of Dartford's involvement in the parade, contact us.